The United Nations human rights office today urged the Government of Thailand to drop criminal defamation charges against two journalists who wrote about the alleged involvement of the Thai Navy with human trafficking. Editor Alan Morison and reporter Chutima Sidasathian, who write for Phuketwan, a small English-language newspaper based on one of the Thai islands, cited a Reuters investigative report alleging the involvement of Thai naval security forces in smuggling Rohingya asylum-seekers fleeing Myanmar, where ethnic Rakhine Buddhists and Rohingya Muslims have been clashing since last year. Mr. Morison and Ms. Sidasathian have also been charged for breaching the Computer Crimes Act for publishing the 17 July online article. Ms. Shamdasani stressed the essential role media plays in imparting information and promoting transparency and accountability on this important issue. “The criminal charges against Mr. Morison and Ms. Chutima could have serious implications on Phuketwan’s future operations, possibly compromising its ability to report on issues related to Rohingya asylum-seekers to the public,” she noted. If convicted, they face up to two years’ imprisonment on the criminal defamation charges and five years in prison for breaching the Computer Crimes Act, as well as fines equivalent to $3,125. The Computer Crimes Act, which came into force in Thailand in 2007, seeks to bar the spread of material believed to threaten national security or create panic. 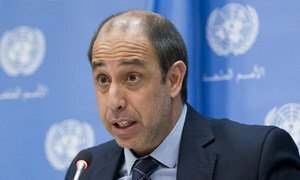 The United Nations expert on Myanmar today cautioned that the situation in Rakhine State is feeding a winder anti-Muslim narrative in the country which threatens the ongoing reform process aimed at a more open and broad-based democracy.